Small sized concrete batching plant is made up of aggregate batching system, mixing system, weighing system, water supplying system, etc..
Pioneer small concrete block plants adopt industrial computer control system, which effectively improve the working efficiency of concrete batching plant, and reaches a new height in automated administration. Small concrete block plant is widely used in civil construction, rural roads, bridges and other constructions. 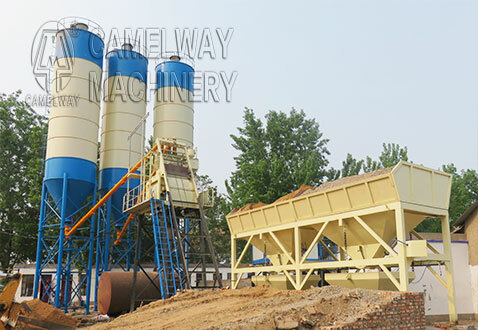 It has the advantages of small coverage area, simple operation, low cost, etc..
HZS small concrete batching plant can mix all kinds of concrete and is suitable to be used in varied construction sites. Small concrete block plants adopt JS compulsory concrete mixer, which makes small concrete block plants have good mixing effect, high production efficiency, low noise and other advantages. In order to fully get the best efficiency of small concrete batching plant and prolong its service life, before starting up concrete batching plant, operating staffs and maintainers need carefully read operating instructions, learn about the structure and working performance of small concrete batch plant to correctly operate and maintain concrete batching plant. How to make high efficiency of concrete mixing station ?